Brigid O’Keeffe is Associate Professor of History at Brooklyn College (CUNY). I am the proud daughter of an immigrant. On my father’s twenty-second birthday, he boarded a plane that deposited him in New York City. I prize the Irish passport with which he entered the United States for the first time. A few years back, my mom was kind enough to give me this memento of my dad’s life. Ever since, I have studied this passport’s contents countless times. I study it with the eyes of a still grieving daughter. I study it with the eyes of a professional historian. In its clues, I see how my dad’s life as an immigrant helped to shape who I am as a person, a daughter, a scholar, a teacher. As his passport attests, my dad was first a migrant worker. Only later did he become an immigrant. There should be no surprise here. He became a migrant worker with the hope that he might one day be able to realize his dream of becoming an immigrant. At the age of eighteen, my dad moved from Cork, Ireland to London, England. (The passport entry reads, in part: Ait chomhnaithe… Sasana / Residence…. England). Page six of my dad’s passport is stamped by the Irish Embassy in London. In London, my dad worked at a Ford factory for several years. He saved money. He sent some home to his parents. His pocket diaries from those years tell us that he occasionally afforded himself the luxury of going to the movies. Years after my dad died, my aunt told me a bit about how she and my dad lived in London in those years. Cheap living quarters. “Dodgy” neighborhoods. Several decades after leaving London for good, my dad – now a “middle-class” American – traveled to London with my mother on a summer vacation. He took my mom to his old neighborhood and, well, he had a panic attack upon arrival. “I can’t do this,” he told my mom. Who could blame him? Four years later, my dad became a naturalized citizen of the United States of America. He received a letter from his State Senator welcoming him to this country. The State Senator spelled our last name wrong (Dear Mr. O’Keefee). I keep this letter, framed, on my chest of drawers in my bedroom. A father’s plight of endless misspellings is now his daughter’s. When I was a kid and even a teenager, I would listen to my dad’s stories of Ireland with delight. Our occasional family trips to Ireland felt like big adventures for a kid from the suburbs of Cleveland, Ohio. I had an unusual name and a dad who spoke with what everyone told me was a charming accent (I couldn’t hear it). No one ever asked me about my mom’s side of the family (they hailed from Poland, but who would guess that by the looks of my name?). I had more cousins living in Ireland than I did in Ohio. But I would get shy when my dad would hold the telephone to my ear, an Irish relative on the other end of the line. Sometimes, I’ll admit, I didn’t understand a word of the English they were speaking to me. Or so I told my dad, before fleeing in terror from the phone. Only a bit later in my life did I start to think about my dad’s Irishness and, ultimately, his Americanness in different lights. I thought about the stories we never heard him tell. I thought about the things I learned only after he died, when I pored through the artifacts of his life searching for answers to questions I never dared to ask when he was alive. And I think now, as I did then, about how terrified my dad must have been – and not only on the day that he received that “IMM. 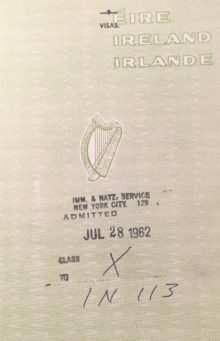 & NATZ SERVICE” admission stamp on his Irish passport upon arrival in the United States. I am my father’s daughter. Sometimes I verge on a panic attack just thinking about the pain my father suffered in the service of what was, very much, his American dream. And I think about his poverty – in Ireland, in England, in the United States – and, again, I damn near have a panic attack every time. I am my father’s daughter. Since 2009, I have taught Russian and Soviet history at Brooklyn College of the City University of New York. The overwhelming majority of my students are immigrants or are the children of immigrants. Their lives, like my father’s life, speak variously but powerfully to the themes that have long fueled my passion for history. Empire. Class. Race. Nation-States. Nationality. Nationalism. Transnationalism. Migration. Languages and their Limits. I could go on… Just like my father’s did, my students’ immigrant stories, spoken and unspoken, not only help to frame, but also enrich the way I study and teach the past. Some things in life aren’t accidents at all. There’s a logic, or a rather a few, to how the daughter of an Irish immigrant came to teach Russian and Soviet history to Brooklyn College students, the majority of whom are immigrants, or the children thereof.